The mysterious pilot of the crimson VF-27 variable fighter that Alto Saotome encounters in a Vajra carrier. 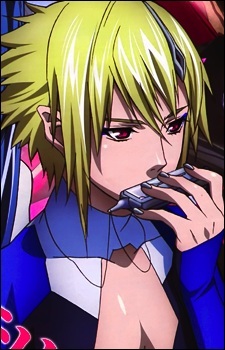 He seems to know how to play the first part of Ranka's song "Aimo" using his harmonica. After saving Ranka from a wild beast attack, the injuries Brera sustained revealed that he is also a cyborg. He harbors a great deal of concern for Ranka's well-being, but he doesn't exactly know why. A picture discovered by Alto Saotome inside the SDF-4 Global revealed that he had some kind of connection to Ranka before becoming a cyborg. It's also revealed that he is a Major in the Galaxy Fleet Antares Squadron. He is currently Ranka's bodyguard and also likes to listen to Ranka's song, decribing the feeling he gets from her songs as being enveloped in a universe that accepts him instead of rejecting him. In episode 21 he is last seen assisting Ranka into delivering her stage 2 Vajra pet "Ai-kun" to the rest of its species. Some time later he and Ranka find the planet of origin of the Vajra. In the first Macross F. movie, he is Sheryl's bodyguard.